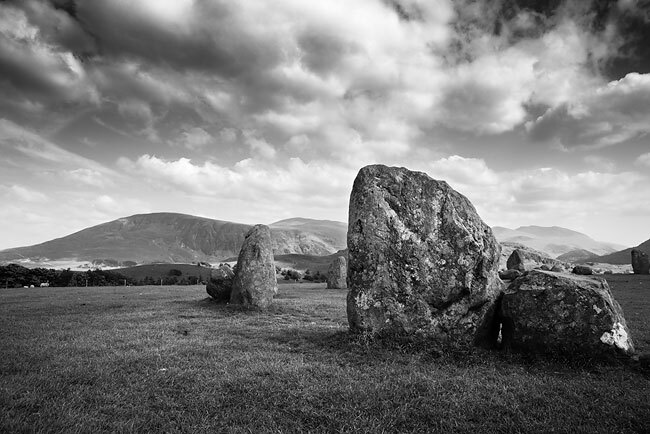 This black and white landscape shot was taken at the Castlerigg Stone Circle in Cumbria, near Keswick and Derwentwater. I think that's Helvellyn in the background. It was taken when on Honeymoon last May/June. Canon EOS 5D + EF 24-105L IS USM lens at 24mm, 1/100 sec @ f/18. ISO 250. Hand-held. Shot in Raw, processed in Capture One 4. Selective burn/dodge layers in Photoshop CS3.